Have something to share, questions about Local 1000 or need help with a news story? Our press center is where you will find our latest news releases and media contacts for Local 1000. SACRAMENTO, Calif. - SEIU Local 1000, the largest union of California state employees, is proud to announce that the California Commission on the Status of Women and Girls (CCSWG) has appointed SEIU 1000 Vice President for Organizing/Representation Tamekia N. Robinson to the California Pay Equity Task Force. The task force is charged with exploring the issue of gender pay equity by engaging diverse interests and facilitating ongoing dialogue between employees, employers, policymakers and other stakeholders on this critical economic issue. SACRAMENTO, CALIFORNIA—After members conducted a rigorous endorsement process for the past several months, the Service Employees International Union (SEIU) today endorsed Hillary Clinton for president, calling her a leader who will stand up for the working moms and dads building a movement to secure a better future for their families. 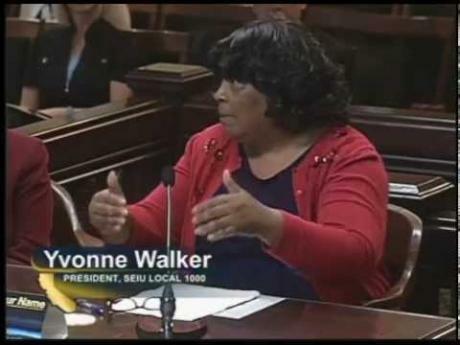 Local 1000 President Yvonne R. Walker testified before a special joint legislative committee March 18, 2015, on Governor Jerry Brown’s proposal that CalPERS offer public retirees high-deductible health plans. “We think that high-deductible plans are a very bad thing,” said Walker, who stated that such health plans do not result in cost savings, they merely shift the costs to retirees. She also discussed alternatives to improve the health of state workers without changing their health plans that would result in lower healthcare costs. A federal bankruptcy judge in Sacramento has announced his intention to ignore years of legal precedent in the city of Stockton bankruptcy case. Some claim his decision may open the door for cities around the country to use bankruptcy as a tool to undercut retirement security for public employees. His decision is bad for public employees, for citizens in these cash-strapped cities and for the retirement security of our aging population. Church and community leaders from southwest Fresno said Monday they want to see more money from the state’s high-speed rail project devoted to helping unemployed Central Valley residents get the training they need to work on the project. They plan to make their case Tuesday at the monthly meeting of the California High-Speed Rail Authority board in Sacramento. For many in the Valley .. the controversial High Speed Rail Project represents out of control spending and a waste of taxpayer dollars. But, for a group of West Fresnans, it represents something else entirely, chance for a brighter economic future, for potential workers and their families. They came together Monday night and are getting ready to take their message to the State Capitol.